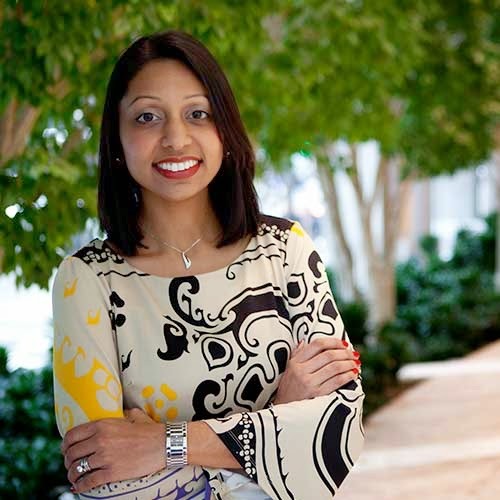 At Deloitte Consulting LLP, Swati Patel has found the perfect job, consulting with drug companies and health care organizations. Based in Chicago, she travels extensively to help her clients contain costs, enhance revenues, and improve performance. Patel has a unique background. By combining her doctorate of pharmacy with a Simon MBA, she brings analytical skills to an industry often in need of a deliberate, measured approach to business. She credits her interest in such an approach to her former boss, Tom O’Brien, who served as chief pharmacy officer for the University of Rochester Medical Center. As it turned out, Patel’s Canadian citizenship meant she couldn’t be both a full-time employee and a full-time student. “Simon’s part-time program was a perfect fit, and I was sold on the world-class reputation of the School,” Patel says. She kept her job, studied part time, and began what would be a 180-degree change in direction. If Patel has any advice for students, it would be to invest in building strong relationships with peers and professors. To de-stress, Patel bakes what she calls “healthy cookies” and enjoys spending time with her two-year-old son. She and her husband love the flexibility consulting has provided to enjoy their favorite leisure activity: traveling. VIDEO: Is an MBA Worth It? FEATURE: Is an MBA Worth It?